A few of the homes on Hodge Road that are included in the proposed Morven Tract Historic District. A debate that has raged on in the tony western section of Princeton Borough for more than six years over whether part of the neighborhood should be declared a historic district could finally be coming to a conclusion. 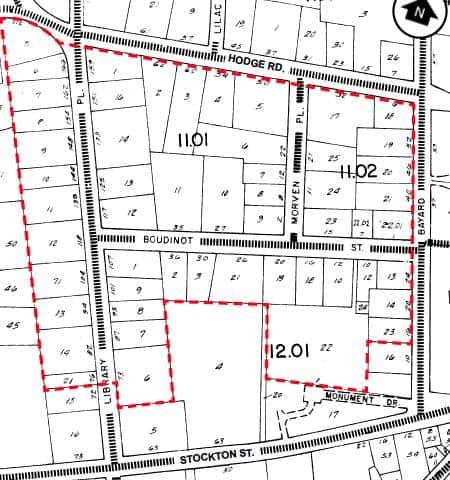 The Princeton Borough Council will finally weigh in on whether to create the Morven Tract Historic District tonight at the council’s 7 p.m. public meeting. Officials will consider introducing an ordinance that would create the district. If approved, the ordinance would then go to the planning board. The issue has divided neighbors, with supporters of the move hiring experts to prove their case, and opponents hiring a lawyer and their own expert. The marathon meetings on the issue over the years have become more and more heated, with some neighbors hurling accusations at others and at officials. “It’s like the Hatfields and the McCoys,” resident Kim Pimley said of the neighborhood dispute last month. The controversial proposed district includes 51 properties bound by portions of Library Place, Hodge Road and Bayard Lane. The district is adjacent to the Mercer Hill Historic District, one of four historic districts in Princeton Borough. The other three are Bank Street, Jugtown and the Central historic districts. Supporters of the designation say the move will maintain the area’s unique architectural character and regulate what kind of buildings can replace tear downs, while opponents argue it would create too many restrictions and infringe on their property rights. The Borough’s historic preservation review committee, an advisory body, unanimously agreed last month that the proposed district meets the criteria for historic designation. But the committee demurred on making a recommendation to the Borough Council on whether to move forward with the historic designation, with members questioning whether the Borough Council should approve the move prior to consolidation, an issue brought up by the layer for opponents of the plan. Committee members also suggested that the people who live in the proposed district should be polled on whether they support the designation. “After six years, we feel very strongly that you should expedite the process,” John Heilner of the The Friends of the Western District told review committee members at the meeting last month. The Friends of the Western District have been lobbying for the establishment of the new historic district since 2006. Heilner noted that 18 sites within the proposed district have either been designated as historic in Princeton’s master plan or have been recognized as historic by national groups. At the meeting, representatives from Hunter Research reviewed the 2009 report the firm prepared for the Friends group supporting the historic designation. They outlined the delineation of the district based on an 1890 map, and discussed the architecture and history of the homes in the proposed district. Mark Solomon, the lawyer for opponents of the designation, countered that property owners must disclose whether a home has environmental problems, a leaking basement or a historic designation when a property is sold. One resident said the new Boudinot homeowners signed the petition opposing the district shortly after purchasing the home. Architect Jeremiah Ford III, representing the opponents, claimed that the district’s boundaries are arbitrary and that using the historic designation so broadly would trivialize it. He said the homes in the district do not share enough similarities architecturally to warrant the historic designation. Anne Weber, an architect who used to work with Ford, disagreed with his analysis and said the designation could also provide other benefits related to traffic, road and sidewalk improvements. The debate at the committee meeting went on for almost five hours. Homeowners seemed unclear about what the designation would mean in terms of their rights to renovate or tear down a home. Zoning officer Derek Bridger said the move would not prohibit tear downs. Residents would have to go through an approval process in order for their homes to be torn down like Princeton Seminary did when school officials wanted to demolish Speer Library. One resident argued that homeowners would need permission to paint their doors a certain color. Others said the claim was untrue. Residents debated how many people in the neighborhood are for and against the designation. Opponents said 31 households opposed it. Some supporters questioned the figures and said the only way to really know how people feel would be to for people to use a secret ballot, because some homeowners are intimidated by the opponents. The chair of the review committee had to pound the gavel several times during the meeting, which evolved into a shouting match, with a few opponents yelling at the committee members more than once. Borough Councilwoman Barbara Trelstad, who sat in the audience, scolded residents for the lack of civility in the debate. “This town is made up of well meaning, intelligent people and you can do better than that,” she said. A map of the proposed Morven Tract Historic District. The area is beautiful and special because its homeowners make it so. Intrusive government controls can do nothing but drive the level of investment in these homes down. I hope it passes. The area is beautiful and very special but without controls, it’s character could change dramatically.